Ora Gelberg knew she wanted to make aliyah when she was 17 years old. "A shaliach at Young Judea camp said you have to go to the land," recalled Ora. "I couldn't give up college, so I studied agriculture, made aliyah in 1950 and went to work on a kibbutz as a shepherdess." Five years later, the kibbutz asked volunteers to go to Eilat for a year, and Ora went. She held many different jobs during her four years there, including working in a restaurant, polishing granite, teaching English to immigrants, and guiding tourists. A high point was acting as a guide to Dr. Jonas Salk, the inventor of the polio vaccine. She was also the first person to deliver mail throughout Eilat. While in Eilat, Ora was called up to serve in 1956 during the Sinai campaign. She wrote her mother a letter that read, "I don't know when this letter will get to you because I'm in the army and Israel is at war." The five-day war was over by the time it had arrived in her mother's mailbox, but Ora's letter was printed on the front page of the Hadassah newspaper. She returned home to Queens, NY in 1958 for a visit with all intentions of returning to Israel. She took a job with the New York offices of Zim, the biggest cargo shipping company in Israel, and met her husband Myron in 1960. She ended up staying in New York, taking a job with an Israeli communications company that allowed her to visit Israel every few years, and got involved with Hadassah. "I had to have Zionism in my life. That was very important," she said. It was after bumping into Jewish National Fund's Planned Giving Director Judy Feig on the street a number of years ago that sparked Ora to get involved with the organization. First, she and Myron attended a Chanukah lunch at Jewish National Fund's offices. 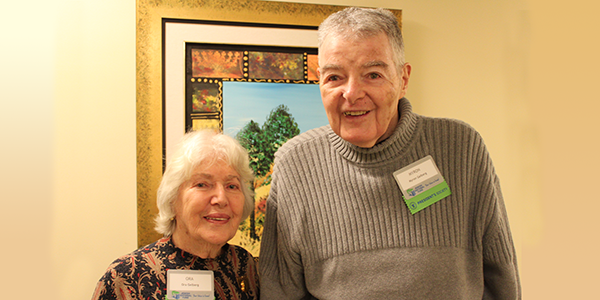 From there, the Gelberg's support has grown, including planting trees for different occasions and investing in a number of annuities with the Planned Giving department. "It's a good investment for us," said Ora. "It's tax deductible, we get a great return on our investment, and we know where our money is going. I'm most impressed by the water projects, especially having a brother in Berkeley who often complains of the water shortage there. With Prime Minister Netanyahu and California Governor Brown working together, California will be able to learn about water conservation from Israel's example." Feeling how she does about Israel, Ora was overjoyed that Jewish National Fund could help her cousin's daughter Sophie go on a Taglit-Birthright Israel trip. "Now she wants to learn more about Israel and Judaism," said Ora, "and the trip also helped teach her how to defend anti-Israel sentiment that can occur on college campuses. "She was truly thrilled to have gotten the chance to have this experience. And I was so happy that Jewish National Fund could make this possible."